As charming and wry as Evans’ bright debut (Faithful Unto Death, 2012), filled with reasons to own dogs, love your children and your wife, and have faith. My twenty-two year-old son is in the hospital with an especially nasty staph infection that took my six-foot three-inch ex-football playing son from offensively hearty (that’s a football pun I’ve snuck in there), to flat out on his back in the space of about seven hours. I mean, from the first twinge of pain he felt, to me discovering that my Mini Cooper really does have go-cart handling if a mom needs to get her son into the emergency room in a hurry, we’re talking right at seven hours. And the reason this is a suitable topic of conversation for the Jungle Red Writers is because as I sat next to my son’s hospital bed, watching my really tough kid in very real pain, I started thinking, “You could kill somebody with a bug that works that quick.” You could, too. 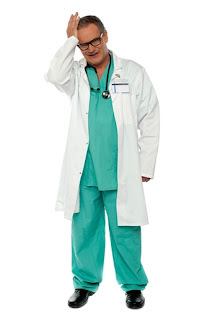 I asked his doctor and he gave me the stink-eye and Charlie said, “Mom,” all drawn out, but the doctor said that, yeah, he thought you probably could and then he carefully gathered up every last bit of the dressing he had changed and took it out of the room with him. I think that way now. About the possibilities. When my husband Richard took me to Padre Island off-season and we had the entire beach to ourselves and there were twenty-foot dunes behind us and nothing but sand and sea and sunrise in front of us, I started thinking how if a couple was on the Padre Island beach off-season, and he was as much bigger than her as Richard is than me, and if he wanted her out of his life…well, this would be the time and the place. Piece of cake. Hold her face underwater until she drowns, dump her the rest of the way in (because almost no one accidentally drowns and only gets their face wet), and walk away. Who’s to know? I shared this with Richard and he said wasn’t this supposed to be a romantic weekend and did I think that comment was helpful in setting a romantic mood. And Richard is a lot bigger than me and I did not want him mad with twenty-foot dunes behind me and the cold, sullen Gulf of Mexico in front of me, so I got with the program. And it’s not just murder methods that attract my attention now, it’s motives, too. I’ll tell you what, when that eighteen-wheeler rode the bumper of my Mini Cooper for a thirty mile stretch of West Texas desolation, well, it’s a good thing I don’t carry a grenade launcher in my backpack. There would have been chicken feathers from Abilene to Lubbock. We had an especially media-worthy murder in Texas not that long ago. A woman killed her husband. Do you know what that man had done the night before she killed him? What her motive was? He had told his wife about his mistress, and then, body part by body part, he had compared the charms of the two women and the wife came up short every time. Readers, that’s a motive--that man wanted to die. That was like suicide by proxy or something. She’s in jail for it but that’s only because we don’t want y’all talking about Texas any worse than you already do. There should be a reasonableness clause. So this is what I’m asking; I know it’s not just me. I know you, too, are getting these dark thoughts at inappropriate moments. I’d like to know what some of them are. You do that and I’ll send someone Faithful Unto Death and Safe From Harm, the first two books in the Sugar Land Mystery series. I just want to know I’m not all alone out here. With my dark thoughts. HANK: Oh, Stephanie. You are among friends. Nuff said. SO? Who's gonna be the first to confess? Stephanie Jaye Evans is a fifth generation Texan. She received her B.A. from Abilene Christian University and her Masters of Liberal Studies from Rice University. She wrote a mystery as her master’s capstone project. That mystery, Faithful Unto Death, won the 2010 William F. Deeck-Malice Domestic Grant for Unpublished Writers. 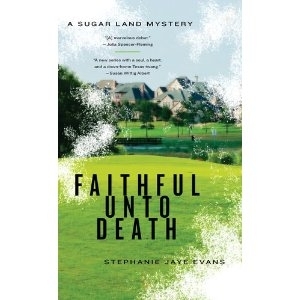 Faithful Unto Death—A Sugar Land Mystery, published by Berkley Prime Crime, came out in June 2012 and is an Agatha nominee for best first novel. 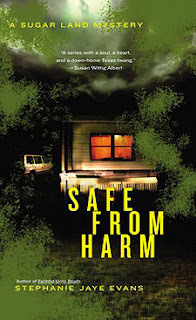 The second in the series, Safe From Harm, will be out March 5, 2013. 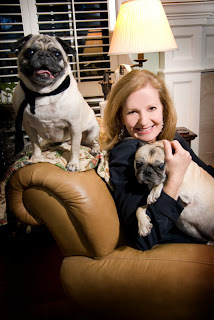 Kirkus Reviews writes of Safe From Harm, “As charming and wry as Evans’ bright debut (Faithful Unto Death, 2012), filled with reasons to own dogs, love your children and your wife, and have faith.” She is currently at work on the third novel in her Sugar Land Mystery series. Oh Stephanie, that's hysterical. Thanks for sharing! Last night my husband went off to play bridge, leaving me to wrestle with dark thoughts with my two writers' group pals. "It's a good thing you don't me at Starbucks," he said, shaking his head. "You'd all be in jail." I can certainly see how writers would get into the mindset. But at least as writers, you have a reason to analyze things in such detail. For those of us who are fans, especially those that read tons of mysteries each year, we also start to think that way. Somehow, I don't think anyone is going to buy the excuse that we are doing "research"...at least I hope not. Although plenty of bodies drop in my books, my dark thoughts turn to finances. Give me a financial transaction and I am figuring out a way to game the system. What happens when you give your credit card to a waiter? What's to prevent your financial advisor from doing a Bernie Madoff and cooking his books and your goose? How does one landscaping service provide the same "service" at half the cost? And then I start thinking about what someone would do when they found out the answers - which is where the dead bodies start to pop up. I have learned to keep my speculations to myself to avoid those funny looks. Stephanie Jaye Evans - How fun to see you here! But, whoa, I have to admit, I had no idea you were capable of such evil thoughts (good for you!). I have dark and evil thoughts too. The latest came when a person hit me from behind while I was sitting at a red light. They hit me because they were talking on their cell phone. Actually, it was a gentle hit because they were so engrossed in their phone conversation they were driving along at about one mile an hour. Most of you here already know how I feel about cell phones - this little incident has notched that feeling up another several degrees, and I'm shocked - shocked! - at the thoughts that pop into my mind concerning them. anyhooooooo - Welcome, Stephanie. Y'all - I am such a fan of this woman. If you haven't read her books yet you just need to get busy. You will LOVE them! Ah, so timely...I'm teaching a class for child care providers and last night one woman was just unbelievably rude. What I thought was, "Back off b*tch, I read a lot of mystery novels and I will find a way to end you..."
Hi Stephanie! Thank you so much for being here today..you are such a bright spot in a gloomy world. I am off to work..and will be back later..
What fun, Stephanie! I have been with writer friends in a restaurant, discussing whether cyanide is the only way to kill someone quickly, and we realize the whole restaurant has gone silent! Speaking of a bug that'll kill someone fast, that reminds me of the Robin Cook book Toxin where a girl dies of e-coli from a hamburger. And there was another book that I think was called The Eleventh Plague about a crazy guy who killed lots of people in different ways (biological warfare types of deaths). If you have a piece of food such as a scone that's hard as a rock you might want to throw it at your enemy. Mysteries do help you imagine ways to get rid of people, but so do movies with their ingenious devices. Glad to know there's someone else out there with this advantageous way seeing the world. Ah, Stephanie! I so sympathize. I'll never forget the look on the face of the barista at the Starbucks in the lobby of the Hyatt when a group of us were sitting around a table listening to Lucy Zahray, the Poison Lady, tell us the cheapest, best, and easiest ways to kill people. I always worry a little that someone will bump off Ben someday and the police will find all the murder research I've done in my browser history, and my goose will be cooked. Hey Stephanie. I really liked your first book; need to read the next one. Since I live in Houston I got a kick out of Sugarland starring in your books. I don't speculate on ways to rid myself of people. No, it's more like evil things to do to deserving people. You're right about S Padre. I was there for the first time last month when it was 20 degrees colder than normal. Deserted, except for interesting flotsam and jetsam and lots of hard hats from the offshore rigs. How do they lose that many? And it can be so seemingly mundane. Carl Haissen uses items he clips from the newspaper, things that could include any of us. Like the spouse disappearing from the cruise ship. Of course, south Florida may have more than it's share of quirky news! For sure Libby, South Florida has plenty of quirkiness. And Carl Hiaasen is a master at finding it! Linda, my hub tells people to make sure there's an autopsy if he meets an unexpected end...I think he's mostly kidding! It is the regrettable fate of crime fiction writers to sit next to hospitalized sons, daughters and spouses, lending support, being "there" for them, being a nurturer--and musing on possible ways to exploit the setting/ illness/accident. But so it is: we must all just learn to live with the shame. Stephanie, I enjoyed this post so much and congratulations on your new book! As a dedicated and longtime reader of mysteries, I had never stopped to think about the mayhem that must clutter their authors' thoughts at the most inappropriate times. My thoughts of mayhem occur mostly when I'm driving, when I constantly talk to myself about what I'd like to do to some of the drivers "sharing" the road with me. If anybody outside heard me, I'm sure they would call 911. My passengers just laugh themselves silly. BTW, as a native of Corpus Christi, I do affirm that the beach is best off season. Sorry to be so late to the party Stephanie, I hope you still get to see this. I once wrote a short story about a wife, using the bats that infested her house, to cover up the murder of her husband. I forget how it worked, I'll have to dig out the story, but it sparked from a real life adventure, in which we had bats in the house, and something the exterminator said, sparked something in my mind. I've been to Disney World (especially when I learned about their underground tunnel system) and other such family places where I've done a "hmmmm, wonder how I'd get away with murder here?" Mystery lovers are just such twisted souls! What I Did for Looks. THERE WAS AN OLD WOMAN Launch Day!! !